Are you getting the “ORA-01031 insufficient privileges” error? Learn what causes this error and how to resolve it in this article. The cause of the ORA-01031 error is that you’re trying to run a program or function and you don’t have the privileges to run it. You attempted to change a username or password, without having the appropriate privileges. You attempted to query a table where you have at least one privilege but not the required privilege to run the query (e.g. you have SELECT but not UPDATE). You attempted to start an Oracle database using the CONNECT INTERNAL command. You attempted to install an Oracle database without having the appropriate privileges on the operating system. There are many solutions to this error message. First, you could ask the Oracle database administrator to grant you the privileges you are missing. Often this can be an oversight (a missing privilege in a script or a change that wasn’t implemented correctly), so they may grant it to you. If they won’t grant you the required privileges, you can ask the DBA to execute the code or statement for you. This is common if you have some privileges but not the required privileges. Let’s take a look at an example. You might get the ORA-01031 error if you have SELECT privileges on a table, but you’re trying to run another statement (such as UPDATE or DELETE) and don’t have permission to do that. We’ll use testUser to test our SELECT queries. The only privilege granted to testUser is DELETE on userB.table2. Nothing has been granted on userA.table1. Now, let’s connect as the testUser and run some queries. We get the first error because, according to testUser, the table doesn’t exist. It actually does exist, but testUser has no privileges on it, so this is expected behaviour. Now, we get the ORA-01031 on the second table because we have the DELETE privilege, but not the SELECT privilege. We can see the table because we have at least one privilege on it, but we get this error because we don’t have the privilege to do what we want on it. If you’re getting this error when creating a view, then it’s likely due to not having the correct privileges on the underlying table, or tables. A CREATE VIEW statement contains a SELECT statement. So, check that you can run the SELECT statement successfully. If you can’t, then check your privileges against this table. You might need to ask for the privileges from the DBA, or ask the DBA to create the view (as mentioned above). If you can see the data from the SELECT query, but can’t create the view, it could be you don’t have the appropriate privileges to create the view. To create a view in the database, you need the CREATE VIEW privilege, as well as the SELECT privilege on the underlying tables. If you don’t have this, then ask the DBA to grant it to you, or ask them to create the view for you. You could get this error as you’re creating a table. If so, then it means you don’t have the right privileges to create the table. This might seem obvious, but I thought I’d clarify. You need the CREATE TABLE privilege to create a table on the database. 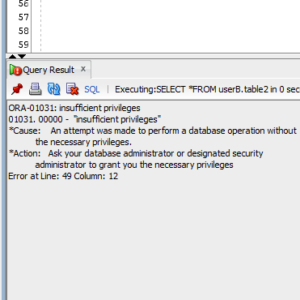 Just like with the earlier scenarios of this error message, you can ask the DBA to grant you the privilege, or get the DBA to run the statement and create the table for you.